There is always a danger when you really, really love a film that the follow-up somehow falls flat. This is especially true of Paddington. I still vividly remember the shimmers of excitement when the bears first appeared on the screen, and I knew in that moment all would be well. And with a stellar cast on board and having fun, it remains one of my all-time favourite films. So 2 had a lot to live up to. And I'll be honest, the casting of Hugh Grant did not fill me with confidence. Yes he looks OK in the trailer, but could he loosen up enough to get on board with the general chaotic vibe of a Paddington film? Because key to being in a Paddington film is having fun. It's not about you, it's not really about your performance, it's all about how the whole film feels. And just like our hairy hero's debut outing, Paddington 2 feels like a massive, warm, fuzzy, marmalade-scented hug. And the key is the bear himself. 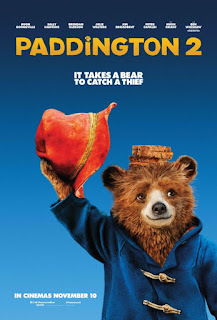 Ben Whishaw again shows himself to be perfect in the role as Paddington's voice, capturing perfectly the wistful naivety and honest innocence of a bear still getting to grips with a world on his terms. Helping him through life are, once again, the Browns and Mr Gruber - who having adjusted to a Paddingtoned life are now on board for whatever madcap escapade ensues. 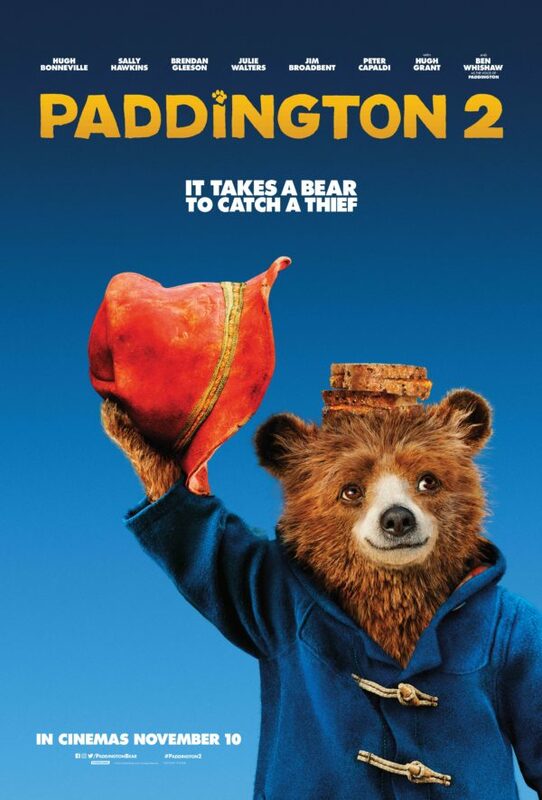 The plot this time around has Paddington trying to get the money together to buy Aunt Lucy a birthday present, only for the book he has his eye on to be stolen. Where the first film was a well-woven collection of short stories with an over-arching narrative, 2 deviates from this a smidge by having longer sections during the second half of the film. And while the flair and style and panache of the first is retained, certain quirks and interludes have been dialled down a tad - Paddington, like the rest of us, has grown up ever-so-slightly in the past two years. But none of the magic is lost. From the opening scenes, you are again awash in the warm and fuzzies, grins never far from your lips. And the huge cast of stars - Brendan Gleeson, Grant, Sanjeev Bhaskar, Meera Syal, Joanna Lumley, Jessica Hynes, Tom Conti to name but a few - simply adds to the feel-good factor. There really is something magical about this little bear. But this isn't a flimsy, fluffy film. Oh no. There are moments of real drama and tension, and as before a moment where the whole cinema just fell silent. You only get that sort of reaction when everyone is invested in the experience. There is also so much going on here - so many asides, so many quick quips, nods to the classic TV series - that you can't take your eyes off the screen. You see, Paddington is simply the perfect movie. It will make you laugh, it will take your breath away, it will make your old cynical eyes well-up on more than one occasion. And it will have you walking out of the cinema on a small cloud of happiness. Sure, once you hit the real world that cloud takes a bit of a hit. But for the time you're with Paddington, the world is a lovely, magical place and one you never want to leave. We enjoyed this just as much as the first one.